Sterling silver Hawaiian Jewelry. 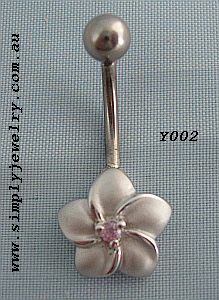 Hawaiian Plumeria (frangipani) design belly ring. The flower features a frosted rhodium plating and central eye of sparkling pink ice cubic zirconia. The bar section is made from 16 gauge, 316L surgical grade stainless steel. Flower diameter 12mm. Bar section 16mm long from flower to ball tip. Actual bar length is 12mm. Ball is 4mm diameter.